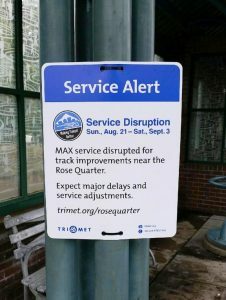 TriMet MAX riders should start planning ahead for the upcoming Rose Quarter MAX Improvements. With the project less than two weeks away, signs and service alerts are going up to inform riders about the temporary service adjustments necessary from the start of service Sunday, Aug. 21 through end of service Saturday, Sept. 3. MAX Blue, Green and Red lines will be disrupted and all MAX lines will have reduced frequency. Special schedules have been posted on trimet.org and our trip planning tools reflect the adjustments during the two-week project. 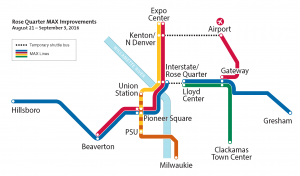 Riders also can pick up a special Rose Quarter MAX service brochure at the TriMet Ticket Office at Pioneer Courthouse Square or call 503-238-RIDE (7433) for help planning their trip. TriMet staff are posting signs at all MAX stations during the next few days and alerts are posted online, on TriMet’s Twitter and Facebook pages, on digital displays at stations and sent out via our service alert emails. Also, for more than two weeks, TriMet customer service staff have been riding trains, handing out more than 10,000 brochures and talking with riders about the disruption and service adjustments. e’ve put together a special web page, trimet.org/rosequarter that has animated maps of the service adjustments, line-by-line details and tips for riding during the project. We appreciate our riders’ patience and understanding, and their help by adjusting their travels during the two-week disruption. During the two-week project, consider altering trips to avoid main commuting hours, when trains will be extremely full. Plan ahead for your travels during the two-week project. Go to trimet.org/rosequarter to view the MAX schedules during the project, view animated service maps and get more tips for riding. TriMet’s Trip Planner shows the adjusted schedules, shuttle bus connections and trip times. TriMet Customer Service personnel at 503-238-RIDE (7433) will happily help plan your trip. Room for bikes onboard MAX will be very limited due to crowding. To prevent extended delay, cycle the entire way, park your bike at a station or leave your bike at home during these two weeks. It also may be the perfect time to try BIKETOWN, Portland’s new bike-sharing program. Riders have relied on MAX since Sept. 5, 1986 to get to jobs, school, community services and recreation. Since then MAX trains have traveled nearly 77 million miles. As part of TriMet’s agency-wide efforts to make our transit service better and improve MAX on-time performance safely, crews are tackling major replacements and upgrades necessary for any light rail system of such age. During the Rose Quarter MAX Improvements, crews will replace switches and improve the track bed east of the Rose Quarter. Rails into the old trolley barn, next to the Rose Quarter MAX Station, will be removed and crews will re-align the rails running into the station. That will reduce the curve into the northern platform and create a smoother ride. Crews also will upgrade the signal system servicing the transit center, helping us keep trains on-time and increase MAX reliability. Learn about TriMet’s efforts for Making Transit Better.